For the fifth True-Life Adventure feature film, Walt Disney decided to do something different. Instead of letting nature tell the story as he had with the previous films, he would film animals to tell a prewritten story and call it a "True-Life Fantasy." The source material was a book by Felix Salten, the author of Bambi which Walt had previously adapted as an animated feature. Filming took place between Utah and Wyoming to tell the story of a female squirrel named Perri. 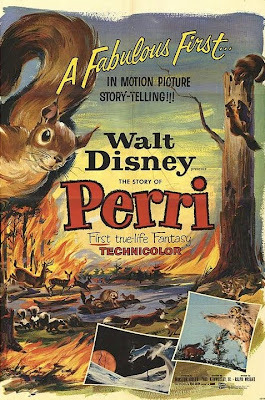 Perri doesn't begin with a spinning globe or a paint brush like the True-Life Adventures, but instead opens like a regular Disney film outside of the series. The story begins in Wildwood Heart as lots of baby animals are being born. The perils of being a baby animal are displayed as several animals try to get at the baby squirrels, but they are saved by their mother who then teaches them how to walk. We follow Perri as she learns about predators and tries to make friends. She meets a male squirrel named Porro, who finds it challenging to build and keep a home. As winter arrives, Perri keeps dodging a martin who is intent on eating her. When Spring returns, also known as "together time," Perri attempts to make Porro her mate. However, a forest fire puts a cease to "together time" as all of the animals try to find shelter. Rain stops the fire, but just as Perri and Porro find each other, the martin finds Perri and Porro must save her. Just as Porro is about to be caught, a bobcat comes and gets the martin. The film ends happily with Perri and Porro sharing "together time." Perri was released on August 28th, 1957. Critics were fairly mixed on the film. Many praised it for its accomplishment of using real nature footage to tell a pre-existing story, but most bashed it for the same reason. While the film was a box office success, Walt Disney decided to not make any more True-Life Fantasy films. However, this wasn't the last film of its kind. Disney would go on to make many animal films with a similar narrative. Perri was successful enough to get several theatrical re-releases in 1964 and 1972. It was nominated for an Academy Award for best score. This True-Life Fantasy is a bit of a mixed bag in my opinion. It feels like a lot of time is spent on other animals, which takes away from the main focus, Perri, and stops the story. However, it has a lot of strengths. All of the scenes are exquisitely shot and beautiful. The suspenseful scenes are gripping and there are plenty of gorgeous scenes, some of which even combine animated elements. The music is wonderful and its easy to see why it was nominated for an Oscar. The films main downfall is the story, which isn't that intersting. While the story has a lot in common with Bambi, and even includes a cameo by the prince of the forest, it lacks the heart and warmth of that film. In the history of home entertainment, Perri has only been released on home video once in the U.S. and that was in 2006 when all of the True-Life Adventures were brought to DVD as part of the Walt Disney Legacy Collection. It can be found on volume 4 and includes a variety of bonus features specific to Perri. Sadly, the DVD is now out of print and copies have become rare and hard to come by. It is now available on iTunes where it is available in HD. A must-see magical film for the elementary school set and a delight for adults as well, particularly baby boomers whose first learning about natural environments came from Disney movies. Admirably, Disney doesn't shy away from the cycle of life and death presenting these American wilderness creatures not merely beautiful and cute but mostly struggling for survival. Therefore, the film becomes an ecological and zoology lesson despite its fictionalized history. Furthermore, the cinematography and the editing are first rate, particularly when considering it was filmed in the mid-1950s. Disney was way ahead of the game when filming nature. Only minus is the syrupy choruses, typical of the easy listening musical arrangements of the era. What a shame Walt Disney Company does not want to release more DVDs on this phenomenal true-life adventure movie. This was the first movie I ever saw at the movies as a child. I was five. It was just shown on on Turner Movie Classics and I am seeing it for the fist time since 1957. It's really very magical. Disney's company should release new dvds with this old beloved movie. It is not available neither in DVD nor Blue-Ray. We have to pressure Disney's company to release new copies. One of my all time favorites. It's kind of sad that Disney today has moved into violent Marvel and Star Wars films and abandoned this kind of nature film. It's great for kids (maybe not too little), the way the Lassie series was. Nature is depicted as both destructive and creative, and life as a constant struggle for survival so it's not entirely syrupy. The amount of footage shot was staggering, 300,000 feet cut to 8,000 for the finished film. my husband and I watched it last night 2/14/17 and really enjoyed it.